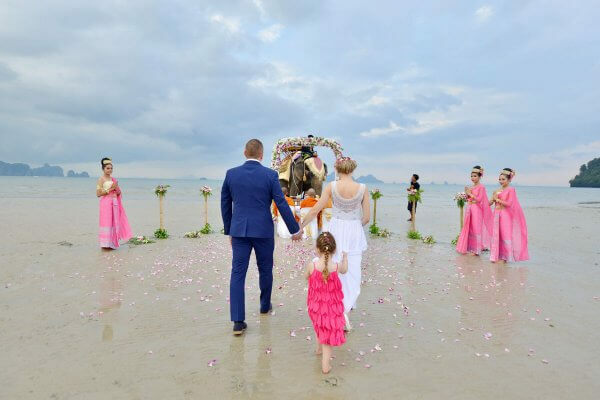 The Elephant Beach Wedding is one of our popular wedding styles for a real romantic mood and worth to recall. On the bride and groom’s wedding day, starts when organizer staffs (costumers, make up stylists and photographer) meet the bride and groom to dress up and lead them accompany with their followers to wedding place on the beach that was decorated marvelously. Bride and groom sit on elephants’ back to the marquee. Wedding with elephants rituals are starting to perform by bride and groom are in front of the witnesses and elephants. Bride and groom stand in front of the elephants and all witnesses stand both sides of the elephants. *** Optional for the couple want to do candle lighting ceremony – Bride and groom sit on the carpets in front of their seat and together make a heap of sand, lit candle(s) and put at the top and shower some flowers on. These show that two people have decided to be together and make their lives grow brightly and beautiful success. After completed this step, they come back to their seats. After that the wedding couple ride on the elephants’ back to the next step, popped out marriage celebration champagne, plant a memorized tree and wave wedding flags. End of the ceremony, everybody go back to the hotel happily and safely. Flower petals shower after ceremony..